On October 6, 1998, a 21-year old college student was brutally murdered. His battered body, bleeding from a gash in his skull, was tied to a fence not far from a mountain hiking trail. His attackers left him for dead, but he clung to life; the only bloodless areas on his face were the streaks left by his tears. He survived for about five days before succumbing to his wounds. The gruesome inhumanity of the crime shocked the US and garnered world-wide attention. Adding to the horror were the bare facts of the case: the victim, Matthew Shepard, was a gay man, the crime took place in Laramie, Wyoming, and the perpetrators fit the profile of homophobic cowboys. It was a story made for the headlines and it was indeed a scandal that captivated the world. The press descended on Laramie with a ferocity that stunned the residents. The main story-line quickly emerged: something like this was bound to happen in a place like Laramie. The press capitalized on the stereotype of the gay-hating cowboy, all the evidence pointing to Matthew’s murder being a hate crime. What could be more obvious? While that story dominated the nightly news in the days following the assault, Moisés Kaufman, the co-founder of an innovative theater company in New York City, wasn’t buying it. He knew that the simple good guy/ bad guy narrative may garner large audiences, but it certainly does not do justice to reality. Kaufman’s company, Tectonic Theater Project, is dedicated to using theater to explore “social, political, and human issues that affect us all” and Matthew’s murder was certainly all that. While the media seemed to have all the answers, Kaufman wanted to ask questions: Why was it Matthew Shepard who was killed and not someone else? Why did it happen in Laramie, WY and not somewhere else? As Kaufman explained, “The idea of listening to the citizens [of Laramie] talk really interested me.” And so, he and members of Tectonic traveled from New York City to Laramie six times over a year and a half and conducted over two hundred interviews. They shaped their notes and recordings into The Laramie Project. At no point in the play is the horror, injustice and tragedy of the crime in dispute. But it nevertheless emerges as a complicated story. When a news story confirms your expectations, you can bet that it’s functioning as fake news for you. If you hear it and think, “I knew it!” or “I saw that coming!”, and you experience a surge of self-righteousness, then the story is just reinforcing what you already know about who the good guys and bad guys are. I’m not saying that there aren’t good guys and bad guys – of course there are! What I am saying is that when we believe that we are always the good guys we can fail to see how sometimes we are good people doing bad things without realizing it. So when we hear a story that reinforces the goodness of our side, it’s a good time to take a page from Kaufman’s book and ask a few “why” questions. Kaufman could easily have reacted to the news of Matthew Shepard’s murder with a surge of self-righteousness. Because hearing that a gay man was murdered did not come as a surprise to the gay community. Being openly gay was still risky beyond measure in 1998. Until only recently, sexual orientation was sufficient legal grounds for being fired or refused housing, but that was hardly the worst of it. Bullying, abuse, intimidation and open violence against LGBTQ people forced the entire community underground until well into the 1960s and 70s. Something called “homosexual panic” was classified as a mental disorder from 1952 until 1980 and was used successfully as a murder defense. Matthew Shepard’s murder brought much needed world-wide attention to the blatant scapegoating of an entire group of people based on lies and irrational fears. Why aren’t I calling out the gay community for its “I knew it!” response to Matthew Shepard’s murder? Because theirs was not an “I knew it!” with an exclamation point. It was a grief-stricken “I knew it” that didn’t evoke self-righteousness but tears, frustration and anger. It was an expression of the hard-won knowledge of a group that had been, and continues to be, the culture’s scapegoat. It was the voice of the scapegoat insisting on their humanity, challenging the justifications used to abuse, wound, expel and kill them. Now when I first found out [about Matthew Shepard’s murder], I just thought it was horrible. I just, I can’t… Nobody deserves that! I don’t care who ya are. But, the other thing, that was not brought out – at the same time that happened, that patrolman was killed. And there was nothing. Nothing. They didn’t say anything about the old man that killed him. It was just a little piece in the paper. And we lost one of our guys. And a lot of it is my feeling that the media is portraying Matthew Shepard as a saint. And making him as a martyr. And I don’t think he was. I don’t think he was that pure… What’s the difference if you’re gay? A hate crime is a hate crime. If you murder somebody you hate ‘em. It has nothing to do with if you’re gay or a prostitute or whatever. I don’t understand. I don’t understand. The question that hovers over the end of the play is the question that guided Derek Bertelsen’s direction of The Laramie Project for Chicago’s AstonRep Theater: Is this something that could happen again? Bertelsen knows, as well as you and I, that though things have improved in many ways for LGBTQ people, this is unfortunately a rhetorical question. The LGBTQ community still suffers terrible emotional trauma and physical violence. Horrendous proof of this happened only two years ago on June 12, 2016, when 49 people and 53 others were wounded in the Pulse nightclub shooting in Orlando. Human beings continue to be treated like monsters who can be beaten, choked, shot and left for dead without remorse. But it doesn’t have to be like this. Listening can change us and change the world. That hope is what compelled Kaufman and the members of Tectonic to go to Laramie, WY not to judge or condemn, but to listen. That hope is the reason that Bertelsen and the AstonRep are staging this play for Chicago audiences, so we can listen to the people of Laramie and in so doing, encounter the true story of our shared responsibility for one another. 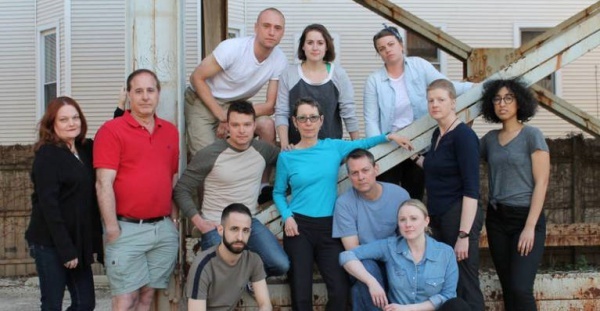 Suzanne Ross will be leading a post show discuss of AstonRep Theatre Company’s production of The Laramie Project immediately following the Sunday, June 10, 3:30 p.m. matinee on the West Stage of the Raven Theatre , 6157 N Clark St, Chicago, IL 60660. Tickets are available for purchase online. Immigration Policy, Sabbath Rest, and the Hope for a Better America We Can’t Change Our Views Without You!